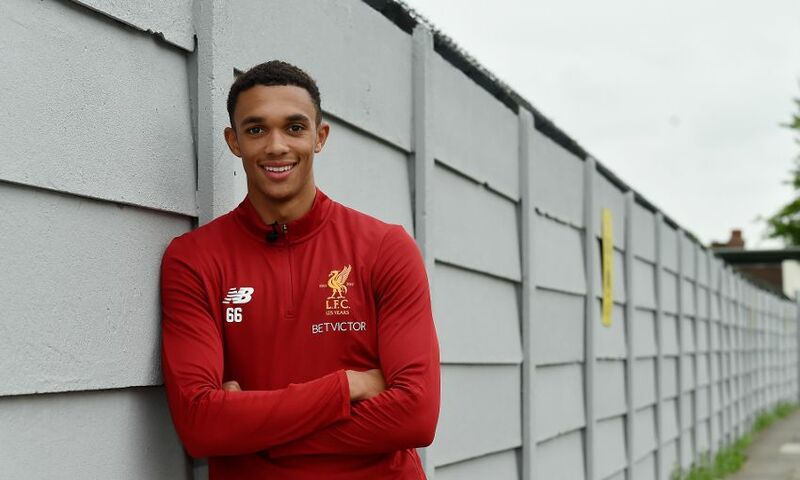 Jürgen Klopp believes Trent Alexander-Arnold's commitment to development means his new long-term Liverpool deal is fully deserved – but challenged the young defender to ultimately show this is just the latest step on the road to reaching his maximum potential. The 18-year-old dedicated his future to his boyhood club by inking the deal at Melwood on Friday afternoon, capping off an incredible 12 months in which he has risen from the Academy ranks and established himself firmly within the Reds’ first-team set-up. “It is fantastic news and brilliant that the club have again rewarded his progress,” Klopp told Liverpoolfc.com. “I think our appeal to young players with the right attitude is clear: if they commit to their football we will make sure we do well for their present and futures. “Trent and the people he has in his life - personally and professionally - make such smart decisions. I love that he is so humble, yet has such big ambitions. This is a wonderful mixture. Alexander-Arnold was promoted to Melwood on a full-time basis last summer and was named on the bench for the opening Premier League game of 2016-17 at Arsenal. A senior debut arrived in a League Cup tie with Tottenham Hotspur at Anfield in October, and the young Scouser added a further 11 first-team appearances to his tally before the conclusion of the campaign. “The credit for this is entirely with Trent,” Klopp said, reflecting on the No.66’s last 12 months. “Yes, those of us around him have played a part as well - coaches, teammates, Academy and development staff. But Trent sets the tone for everything he does with his attitude and character. “He commits to everything he does: he wants to learn, he wants to grow, he wants to develop and his focus is absolutely in the right place. He embraces being part of the first-team environment. He never shrinks or hides. Improvement is something Klopp is keen to emphasise the importance of in all of his young players – and Alexander-Arnold is no different. But in order to do so, the full-back – who can also operate in midfield - will be afforded plenty of patience from the manager and coaching staff. Klopp said: “This is critical. Trent has continued to grow because he has shown a desire to continue to learn. Learn from his coaches, learn from his teammates and learn from his experiences. Klopp is also eager to cite the influence of the staff at the Academy in helping shape Alexander-Arnold’s career path, having first joined the club’s Kirkby complex at the age of six and rising through the age-group ranks before progressing to Melwood permanently. Therefore, the German insists the team at the youth set-up deserve great credit for the role they’ve played. “It is a proud day for our Academy as well as for Trent and his family,” said the boss. “He's a boy with the city and club colours flowing through his veins, and for our Academy staff I know moments like this mean a lot to them. “They play such an important part in guiding the players to the stage where their opportunity with the first-team set-up comes.